Your pic this week is even more RockBoard! 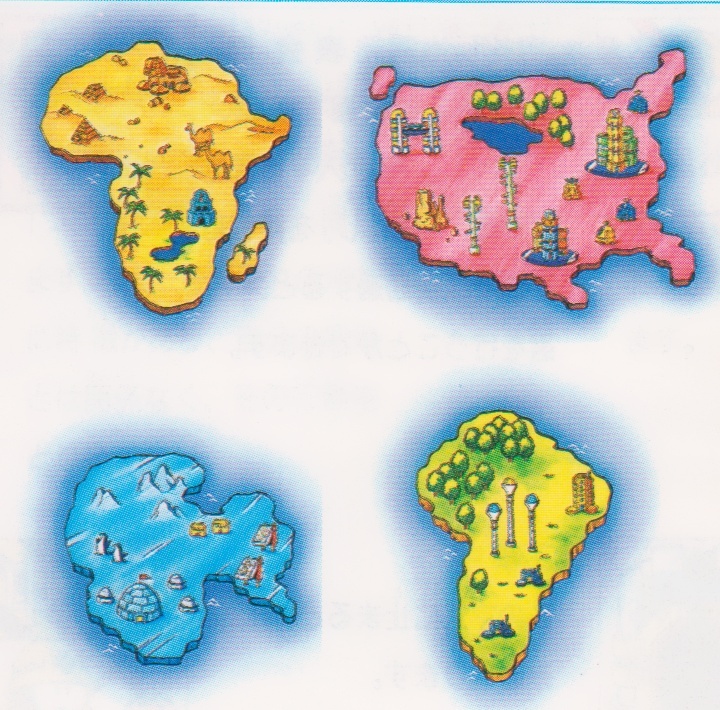 This is the official art for the four stages you play on, from the RockBoard Manual. Fans of global geography will surely recognize that these maps were based on the real continents (and one country) of Africa, the United States, Antarctica, and South America. Or, as the game likes to call them, the Continent of Sand, Megalopolis, Cold Island, and the Green Continent. Based on what I’ve learned from the game, in 20XX property prices will dive and a wide surplus of land will be put up for sale, urging on a worldwide upswing in commercial development that will be so accessible that even grade school age children will be able to participate. Better start saving your zenny! Finally my dream of owning a country and calling it Rock Land can finally come true! Call me obsessed with Legends, but does that Antarctica vaguely resemble the sepia-toned map of Kattelox that Mega Man briefly consulted before Roll crash-landed there in Legends 1? @Ave: Sounds wonderful. How ’bout letting me stay on your property for a reduced rate? 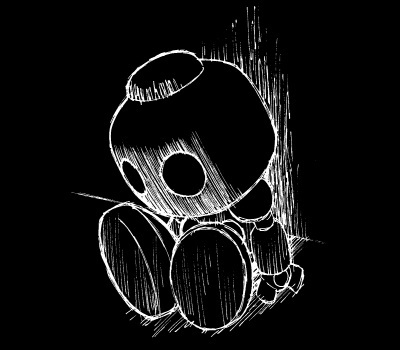 @RAD: I wondered that too back when I saw Megalopolis mentioned as a city/region in X8, but the geography of where that stage seemed to point on the world map didn’t really mesh with what we see in RB. I’m guessing the board continents are just allusive terms. @Das: It really sorta does! Just spin it around a bit, add some erosion… oh yeah, and shift to a warmer climate. I did not know about this game. The continent are cute and wonderful. Anyway, I will try to play this game and try to have my own country like Avegodro.Thank you sharing this interesting game. I am so excited to play it. #20, can I make a request? As you scanned the Rockman 1-3 manuals, I wonder if you can also scan the RockBoard manual?